Many people across the world prefer setting up their business through the internet. The variety of features and the ease to access that the internet provides, make it an ideal platform for business and marketing. Through the technologies of the internet, you can connect with the rest of the world setting from the comfort of your home. Business and entrepreneurship are essential for the sustenance of the human kind and internet aids that is many ways. The marketing strategies that are possible with the help of the internet are a very innovative option for ensuring that your business thrives. The basic necessity of digital marketing is a website, and if you want, you can easily design it on your own. The WordPress, content management system, gives you the opportunity to design your website from scratch. So, In simple words, you can simply use the WordPress CMS for building your own website. There are different types of the content management system which helps to put up new contents of various kinds through a website on the internet and WordPress is one of the most popular choices among them. There are other choices like the Joomla, Drupal, Blogspot and many more which are similar in pattern but the flexibility and the user-friendly interface that WordPress provides you with makes it stand out from the rest. The customizable themes and widgets together make it a very easy to use interface that you can easily handle whenever you are looking for a way to design a website. Here we are going to give you the various ways in which you can design the website with the help of the WordPress interface. It is easy and SEO friendly by default. The features are suitable for blogs, and even for business websites as well. 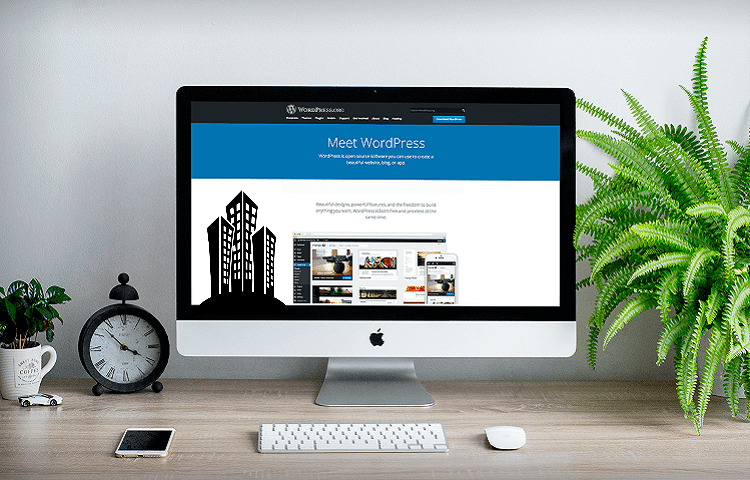 Why Use WordPress your website? How can WordPress Boost your SEO? First and the foremost task would be to visit the WordPress website and then sign up for a new account on the interface. Generate a username, password and an e-mail id that is linked to the WordPress account that you have. Enter the correct credentials and provide the security key question and other factors so that you can uplift the security of the website. The account is the basic need so that you can enter the WordPress interface and then start creating the site. Once you register for the WordPress account, you are given 3 GB of free space by default, and you can input content up to 3 GB for free on the website, and after that, you have to buy the domain of the website and also the hosting. If you want you can even shift the hosting of your WordPress website when you are renting the hosting and WordPress allows this flexibility. It depends which kind of hosting you want either a free one from WordPresss.com or create your own blog/website using WordPress.org. The website URL is essential and should be chosen such that it is on par with the theme of the website. The name should be unique and not be taken already as it would not be available then for your need. Also, make sure that the website URL is easy to remember and not too long. Using your name as a part of the URL is a great way to make it unique and easily recognizable to the viewers. You can create multiple URL under the same profile that you have on WordPress, and this is another factor that should be remembered about the WordPress interface when you are choosing to create a website with it. There is a specific field to enter the website URL and once you have chosen and entered the URL and clicked on the option to confirm it, remember that it cannot be undone. And this is why it is vital that you choose a name that you would not want to change in the later times. When you are registering for a free website, the extension would be “WordPress.com,” and that would be removed only when you buy the domain and make the website and independent one. There is always a competition among the WordPress and Blogspot but I think that WordPress has won the fight against the Blogspot CMS. Once website name is decided, the website layout and theme is a major factor to be taken note of. There is a number of WordPress themes which are free or have nominal charges that you can choose from and there are certain factors that you should keep in mind while making this choice. The first and foremost factor to be taken note of is the type of website that you are trying to develop and whether the chosen theme is on par with that idea. For example, a business website dealing with electrical gadgets would look very out of place when the theme chosen for it is floral. The website themes are customizable, and you can change the color scheme, the font to be displayed, the layout of the page, the menu bar design and many more. All this can be previewed before the website is actually launched and hence you have the advantage to judge how your site would look in real once it is launched. You would be given the tablet and mobile view as well when you are working on it since the majority of the WordPress themes are responsive. While WordPress website is easy to develop, seeking professional help for the same are not a big issue, and you can always get some. The main advantage of having a professional help would mean that you are going to get more time to concentrate on other aspects of business while someone else takes the responsibility of building your website for you. The https://www.bigdropinc.com/ is one of the top choices that you have when you are seeking website designing solutions. Apart from that they also provide other relevant services for website marketing, and you can rest assured that your marketing and website planning would be systematically done when you choose the professional services they provide. It can be concluded that website designing with WordPress is very easy, but it is time-consuming which is why most people seeking a professional to help them out with it. Nice breakdown Barrack. WordPress or bust LOL. Gotta go this CMS route if you want to build a reputable site these days. Or if you just plain want to make money online. No other viable option.